Often when I watch a movie, I imagine what it would be like if I were to experience such a thing. What if it was me? What would that actually look like? feel like? be like? And I might sort out some logistics, fitting it into my current lifestyle. OR, I insert myself into the setting I see, without any prior context other than who I am. And when I begin asking myself what it might be like to go through this experience/ordeal/adventure/nightmare (whatever the genre), my thoughts naturally and inevitably lead me to ask, "What would it have been like to go through this... on my period? Would I have been able to plan for that and toss supplies into my bag before we spontaneously had to leave on this emergency escape trip? What if my period starts mid-adventure? Can i get supplies? Is there a drugstore nearby??" It's also sort of the equivalent of Tina Fey's character in Date Night when she says to her husband played by Steve Carell, something like, "Just remember, everything you're doing, I'm doing--in heels!" Like non-heel-wearing, it's just a reminder to be grateful for non-menstruation. It's been 25 years I've had to endure "the curse" and I can tell you, a person doesn't really "get used to it," and there's not a non-period day that goes by where I don't say a special prayer of thanks, and I'm not kidding. Every woman on this green earth will back me up and immediately sympathize with anyone on their period at any given moment. But back to movies. I read the Hunger Games trilogy this month and it was awesome. It just gets better and better. When I finished I was left feeling like I'd gone on a journey with people I came to really know and care about, the resolution felt satisfying though with some questions unanswered, which i like, the story itself was complex and intricate, highly detailed and real. Suzanne Collins really nailed the requirements to successfully write a sci-fi story. She created a whole world and a problem that beautifully and also frighteningly balanced the line between plausible and implausible. Sean and I have begun the movies and I'm still thinking about the books so much that I told him I'd probably just start reading him the books when we're done with the movies (which he enjoys, but can't ask me to do). And the cycle will continue for the rest of my life. Ugh, as if fighting kids to the death wasn't bad enough. Hunger, thirst, fatigue, fireballs at your face, dirt, burns, being soaking wet. UGH. She's such a hero. 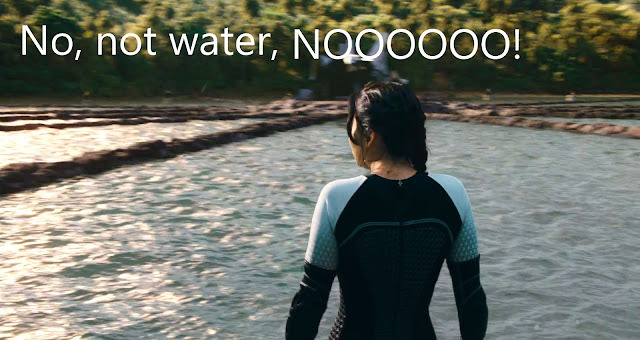 I mean, I guess she could try to communicate her need for supplies to Haymitch from sponsors? How unbelievably awkward, in front of the whole country. That'd be a hefty price to pay to prioritize period supplies. Water? Or tampons? That's a tough call. Even if it was the Careers--still, ugh. No one deserves that. 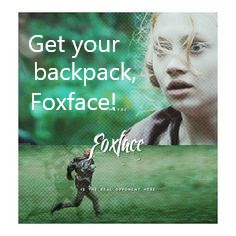 Or in Foxface's backpack of something she desperately needed? I wouldn't be surprised. Probably more, too, since the games lasted weeks apparently, and some of these girls made it a good long time. Actually if she doesn't have supplies this probably works in her favor. But still-- hot, sweaty, humid, fighting, scared, monkeys, hungry. None of it's good. 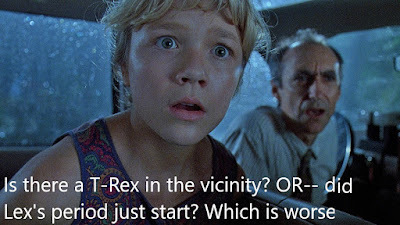 I guess she could have hung out in the blood rain quadrant and no one would be none the wiser. Ugh. Anyway, as you can see I think about this quite a lot. Hopefully you will too now, and whenever you're watching a movie you'll say to your friend, "now imagine her doing all of that on her period!" "which is worse" was meant to have a question mark after it, but maybe it shouldn't? maybe it shouldn't. Also, all of this is reminding me of this video. p.s. Sean said the title of this sounds like a calendar. Hahaha, dangit. p.p.s. I KNEW it was momentum!! Somehow I'd gotten it in my head that momentum was wrong and that it's momento. But it's not, it's nottttt, and i made it into a meme so I can't easily chaaange iiiiiit. Oh well. As I saw where you were going with this I started to do the math mentally as well. So if the average period includes 4 days or so of symptoms, on a 28-day cycle I calculate 14%, or one in seven women experiencing it at any one time. But the longer the games stretched, the more young women would be involved. 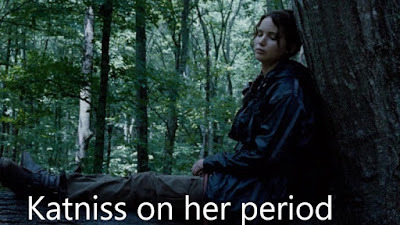 I guess if Katniss spent some of her life near starvation her body wouldn't have been experiencing regular menstruation anyway. What if she was essentially having her first period during the training period and games when she was properly nourished? I need to read the books again, because I remember being seriously disappointed in the third book. I theorized that the original ending was to have Katniss die at the end of the first book and have it stand alone, but the publisher saw $$ and told her to rewrite it and make it a trilogy. But that's not based on any facts. Excellent stats, Joel, thanks. And good point about the starvation state affecting/preventing the cycle, as well as the period starting during training. "Ah, CRAP"
It's interesting because I remember feeling disappointed as well by the third book. I read them at least twice before this recent reread and I remember thinking it got better for me, that i understood it better and it made more sense. 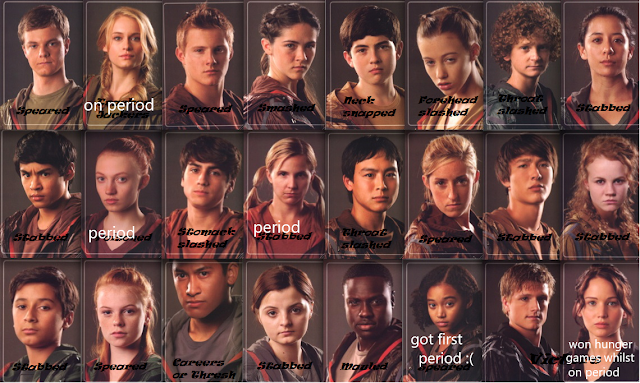 I love Katniss and am happy she was around for the 2nd and 3rd. She's such a freakin' bada$$ and so human and flawed and tough. So since those previous rereads and watching the movies, I've come to really love the story even more. For me, it just speaks to its depth and complexity, that I've significantly changed and developed my opinion about it with all these reads and viewings. I would be interested in hearing others' opinions after revisiting the books. So lemme know.